Yes, Virginia, there was a Santa Claus. According to history and tradition, he lived during the days when the Roman Empire flourished throughout most of the known world. In those days he didn’t travel around in a sleigh pulled by reindeer, nor did he live at the North Pole. He didn’t manufacture childrens’ toys with the assistance of elves. He didn’t wear a suit made of red fur with white trim, although medieval artists sometimes depicted him in red robes. He didn’t grow his long, white beard until his middle years, and although we think of him as an immortal old man, he actually had a childhood and youth like any human. Despite these differences, he did have one thing in common with “Jolly Old St. Nicholas.” (as we have come to know and love him today) – he was a giftbringer. He gave gifts at night with great stealth. He waited until everyone in the household had gone to sleep, and then he crept inside, left his gift, and departed. His nocturnal visits were kept a secret, as he did not want the recipients to know of his generosity. At first he didn’t give gifts to everyone, but only to some particularly fortunate young women. He tried his best not to let it be known that he was the mysterious benefactor. However, in spite of his attempts to keep quiet about his good works, his reputation as a friend to the poor and the have-nots quickly grew and spread. Even during his own lifetime, people considered Nicholas a saint. 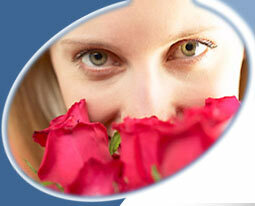 What makes a person a giver? How does a man gain a reputation that grows from generation to generation until he becomes known as the greatest gift-giver of all time? What causes an individual to put the well-being of others ahead of his own personal needs? This is the kind of fundamental inquiry from which the following narrative grew. It was meant as a parable of the relationship between human beings and material goods, as a fable depicting a human heart’s transformation from selfishness to selfishness. All of the sources tell us that Nicholas was the son of wealthy, somewhat elderly parents. This information is nearly all that is known of his early life, though some accounts include the parents’ names and imply that their wealth was inherited due to their being of noble birth. How then, I wondered, could a child from a wealthy family, presumably raised with every luxury at his fingertips, choose to give instead of to take? Why did he choose to dedicate his life to benefiting others, when he could have grown up spoiled and selfish? The simple answer, of course is his parents. They were good people, they were Christians, and they raised him in an environment of giving. This is implied in the original story. Having grown up in a household of love, he naturally developed a heart for loving and giving to others, and he proceeded to live out what he had been taught. It’s a very tidy solution. Perhaps a little too tidy. Life is a series of reverses and contraries, of ups and downs, and of backwards and forwards. Not everyone manages to go exactly as intended. A person’s career may begin in one part of the world and in one profession, and by the time the same person retires, his or her pathway may have taken so many twists and turns that he or she ends in another locale and in a completely different vocation. A young rail-splitter from Kentucky becomes President of the United States. A boy growing up on a Missouri farm turns out to the creator of the most famous animated cartoons in the world. A rejected New York showgirl whose talents are considered questionable at best eventually is known as the all-time queen of television comedy. Just as life seldom goes in a straightforward, predictable progression, so are human beings quirky, unreliable, and absolutely unpredictable. An expensive best-selling toy that heads every child’s wish list one Christmas may, by the next year, wind up on the bargain table at the lowest price possible. Even in Biblical times, the same crowd that welcomed Jesus into Jerusalem with palm branches was crying for His blood a few days later. So it may have been with the boy Nicholas. What if, I wondered, he did not start out as a giver? What if he did not necessarily agree with his parents’ philosophy of putting others first? What if, before he knew generosity, he underwent a painful growing-up process during which he struggled with his natural selfishness, and learned only with some difficulty that it is indeed “more blessed to give than to receive”? What if he, in fact, had been human? This line of questioning caused the following tale to unfold. The sources are both history and legend. The characters are based on the little that is known of that nobly-born young man who lived so long ago. How much is based on factual or source material, and how much on the writers’ own fabrication? The more improbable parts are the true ones. For the details, it was necessary to add and invent. The character of Petrus is a creation of the author, but he had his origin in the St. Nicholas mythos. Those familiar with European tradition will recognize at once the transmogrified figure of Black Peter, the saint’s companion who delivers the switches and the coal to unworthy children. The daughters, of course, are part of the original story, as is their father and his encounter with St. Nicholas. The princes were a necessary addition in order to flesh out the story of the Dowerless Maidens. Liberties have been taken in the historical accuracy which has frequently been sacrificed for the purposes of storytelling. Since the chief sources of Nicholas, primarily The Golden Legend, date form the Middle Ages, the late Roman setting is covered with a medieval gloss. For example, priestly celibacy was not a requirement until slightly later in church history, but by the time the legends of Nicholas were written down, it had become an established tradition. In the present narrative it was used to sharpen the contrast between a worldly existence and a religious life. Another example is that nowhere in the original account of the legend does it suggest that St. Nicholas’ nocturnal visits occurred at Christmastime. In fact the association with Christmas during the saint’s lifetime is rather tenuous. However, his reputation over the centuries has become so firmly linked with that particular holiday, it seemed expedient to set the gift-giving against the background of the observance of the birth of Christ. Another juggling of dates occurs in the establishment of December sixth as Nicholas’ birthday. In actuality, this date, which is commemorated in some countries as part of the celebration of Christmas, is traditionally associated with St. Nicholas’ death. However, as it is not completely unheard of for people to die on their birthdays, and lacking any other information about the real date of birth, I used it as the most appropriate alternative. Finally, the Fortunatus purse probably did not yet exist in that early era. However, as it tied in nicely with the theme and made a good object lesson for the boy Nicholas, I included it without further inquiry into its place in history. As for the rest of the story, I followed the blueprints laid out for me by the original legends and my own personal line of inquiry. Once the characters and main idea were in place, the story followed its natural course. If it seems at the end to beg for a sequel, this is because it was originally to have been one small section of a tiny book designed to fit easily in a Christmas stocking. The book was to cover the saint’s life and the miracle that continued long after his death. Needless to say, it grew from there. 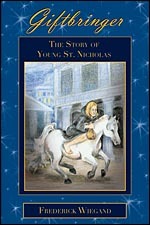 Instead of covering the events of the saint’s entire life and in order to maintain unity of time, place, and character, the focus has been narrowed to that of Nicholas’ childhood and his young manhood. Even though it was originally planned to stretch over a greater period of time, the present work is designed to stand on its own. So, though neither a slim volume nor a comprehensive biography, Giftbringer is an attempt to explain how the most famous giver of gifts grew into his reputation. If it seemed to be a stretch from sleigh bells and reindeer, remember that this is but the beginning of a long journey. This is the story of what really happened. Or rather, it is the story of what might have really happened.